Indiana Senate candidate Mike Braun touts his company health plan as national model, but some of his workers disagree. 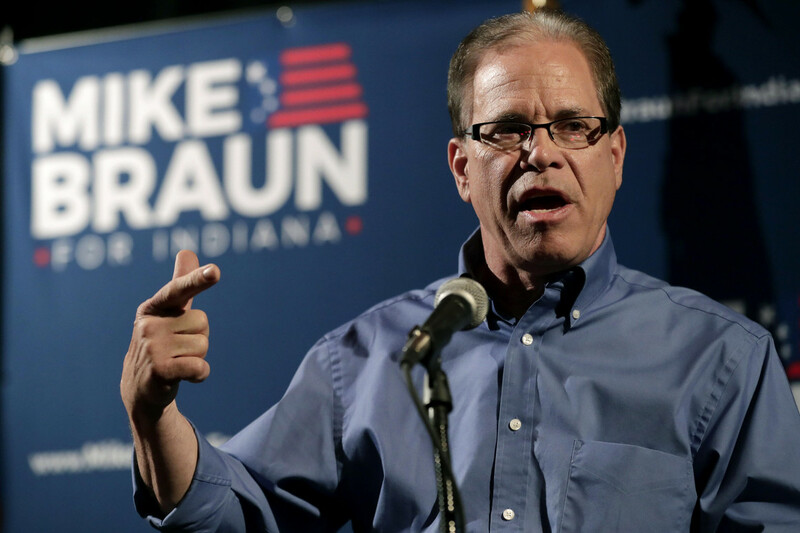 Republican businessman Mike Braun says he wants all Americans to have health insurance just like his own workers — a pillar of his campaign to unseat Democratic Sen. Joe Donnelly in Indiana’s exceedingly tight Senate race. But while he may have kept premiums stable for a decade for his roughly 900 workers, deductibles are sky-high — meaning big out-of-pocket costs for anyone who gets sick. Employees of his company, Meyer Distributing, must spend $5,000 a year on health care before their bills are covered, and families pay double that, or $10,000 a year, according to a copy of the plan obtained by POLITICO. Amid polls showing that health care is dominating 2018’s key midterm races that will determine control of Congress — and Democrats hold an advantage — even Republicans are talking about the issue. Braun has attempted to erase that advantage by pointing to his company health plan as a point of pride, cutting a recent TV ad about it and bringing it up in town halls, campaign stops and local news interviews. His campaign told POLITICO that he covered his workers’ pre-existing conditions “before it was cool” — even though employer health plans have generally had to cover those conditions by law since the 1990s. He’s also criticized Donnelly for allowing Indiana’s Obamacare marketplace to worsen. Donnelly in turn has attacked Braun for backing a lawsuit brought by conservative states that aims to kill Obamacare and its consumer protections for people with pre-existing conditions. The two face off in their first debate Monday night. But Braun’s workers pay far more than most people who get their insurance through their jobs. Some former employees described the health benefits offered by their millionaire boss as “horrendous” and “a joke.” Kluemper, for instance, said his deductible is now half of what it was at his new marketing job in the same town, and some care is covered even before he’s paid that out. Nationally, the average deductible for a single plan is $1,573, according to a survey conducted by the Kaiser Family Foundation and released this week. In Indiana, the averages are higher — about $1,800 for an individual and $4,020 for a family. Braun’s are more than twice as much. Braun has said he brought down health costs at his company by self-insuring, meaning the company itself is on the hook for its workers’ medical claims, rather than a third-party insurance company. He has also touted the stable, low premiums his workers pay — $34.30 biweekly for a single person. For a family, it’s a less-affordable $198.44 (about $5,000 a year). Missing from this story are the high deductibles. The plan does cover certain preventive services for free, as required by the Affordable Care Act. But it doesn’t — before the deductible is reached — cover prescription drugs for chronic conditions, which could get worse, and more expensive to treat, if not adequately controlled. When pressed, Braun has defended the high upfront cost he requires of his workers; many of them start at around $12 per hour. He got a salary of $180,000 from Meyer last year and is worth between $35 million and $96 million, according to financial disclosures released this year. Republicans have historically promoted health plans that required enrollees to pay more toward their care, believing it would make people avoid unnecessary doctor’s visits or tests that drive up the nation’s health care tab. But to workers living paycheck to paycheck, “skin in the game” often means avoiding doctor visits altogether. A study by the Kaiser Family Foundation found that workers enrolled in high-deductible employer plans were “twice as likely as others with more traditional employer-sponsored insurance to say there was a time in the past year when they needed medical care but didn’t get it because of the cost.” Those enrolled in plans like Braun’s were also more likely to avoid taking a recommended medical test or filling a prescription because of the out-of-pocket cost. And if it’s hard to shop around for routine care, it is even less feasible in an emergency. The Braun campaign still sees his experience as a plus. “Career politician Joe Donnelly has meant higher premiums for Hoosiers because he’s busy taking cash from the insurance industry, while Mike Braun has been busy delivering affordability and solutions,” Braun spokesman Josh Kelley said. Donnelly has hit back by promising to defend Obamacare from GOP repeal attempts, including the current lawsuit that Braun has endorsed. He has also hit Braun specifically on his workers’ plan.